What is the European Creative Hubs Network (ECHN)? The ECHN is a two year project, funded by the European Commission and led by the British Council to support the development and support of creative hubs across Europe. It has been developed as a result of the successful pilot Forum that ran in Lisbon in January 2015, highlights of which are in the film above. Our consortium of partners are Creative Hubs from across Europe: Bios (Greece), Betahaus (Germany), Kulturni Kod/Nova Iskra (Serbia), Creative Edinburgh (UK), Factoria Cultural (Spain), ADDICT (Portugal) and the European Business Network (EBN). For more information on the project, please visit this link. Belgrade is the first in a series of three fora of the ECHN project. If you are a hub manager running a physical space or online network, which unites a community and offers a variety of programming, then this programme is for you. Whether you are an emerging or established hub, we are looking for a variety of creative hubs from across Europe to join us in Belgrade. The Forum will be an opportunity for hub managers to connect and collaborate across borders. The Forum will take place from 22-24 September 2016 at the Yugoslav Film Archives in Belgrade, Serbia and has been curated by Kulturni Kod/Nova Iskra. It will bring together 100+ managers and representatives of European hubs from over 20 countries. Themed 'How Work Works? ', this forum aims to map out the diverse ecosystem of hubs, showcasing their value and diversity, along with their invaluable role amongst the creative hub landscape in supporting creative entrepreneurs across Europe, and further afield. The forum will be made up of inspiring keynotes, case studies, panel discussions, intensive workshops, informal networking events and field trips which will combine to offer hub managers insight into space, community and business models. Creative hubs managers will have a chance to meet, network, exchange best practice and get to know each other, which we hope will spark new connections and exciting collaborations. 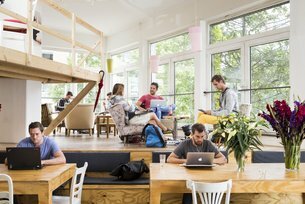 How can creative hubs get involved? We are currently running an open call for hubs interested in attending the forum. Please visit this link for further information on the call and to complete your registration form. The deadline for registration is 20 July 2016. We will be supporting travel and accommodation expenses for a number of hubs globally. You will be notified by 5 August 2016 if your hub is being supported.